Hey everyone! I know that it has been a while since I have mentioned Pinterest on my blog; and, for good reason: I have been very busy making sure that everything is right BEFORE I announce it. I don’t do anything halfway. Besides if you have been reading www.carlarjenkins.com all along, you know that I love photography and Pinterest is my most followed social media at 2275! Now. Drumroll please! My two new Pinterest boards are: YouTube and Instagram! Yes, as you know I am a social media influencer and one of my three main foci of this here site is social media. 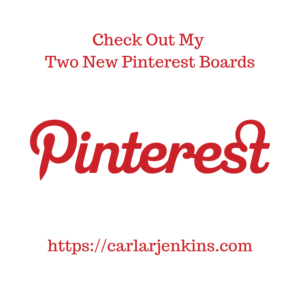 I have created these two boards to introduce my Pinterest followers to my two other social media channels: Instagram and YouTube. As you’ve noticed, I have been big on IGTV since January of this year. Also my IG following has steadily grown to over 830 (I am shooting for 1000 before summer!). Regarding YouTube, I have always shared my YouTube videos onto my Pinterest boards since the beginning. It is reported that 80% of Pinterest content is shared. My sharing these new YouTube videos reinvigorates the platform by giving people new content. Creating my YouTube board gives all of my Pinterest followers the option of seeing my videos as soon as they are released. I am all about why wait when there’s content to create! My Pinterest community deserves to see what I have been up to outside of the platform. These boards are my way of making sure that they get to see my other content without delay!